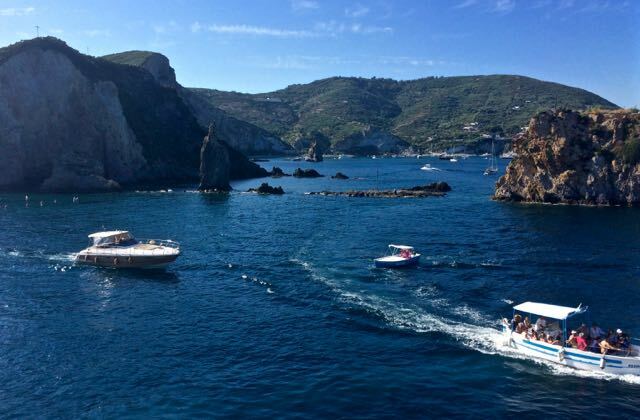 The island of Ponza is a magical place. We spent a few short days there in early summer on the first weekend of the season. I am woken at dawn by fireworks over the harbor which are more sound than show in the warm early light. After coffee we make our way down to the small beach below, book our beach chairs, umbrella and lunch table for the next day before walking the length of Frontone beach to catch a water taxi to town to see the celebration of the island's patron saint San Silverio. The gruff skipper barks at his captain in the sing songy dialect that sounds Neapolitan to me. We arrive in the port and find the town busy with the buzz of the tiny van taxis that zip up and down the narrow road that curves along the port. All the boats in the harbor are festooned with small bright primary colored triangles. Myrtle branches have been wound around lampposts and balustrades and Festival lights that will twinkle pink, purple and green later tonight decorate building facades. We secure a table at the bar with that will give us a good view of the procession that will soon leave the cathedral. 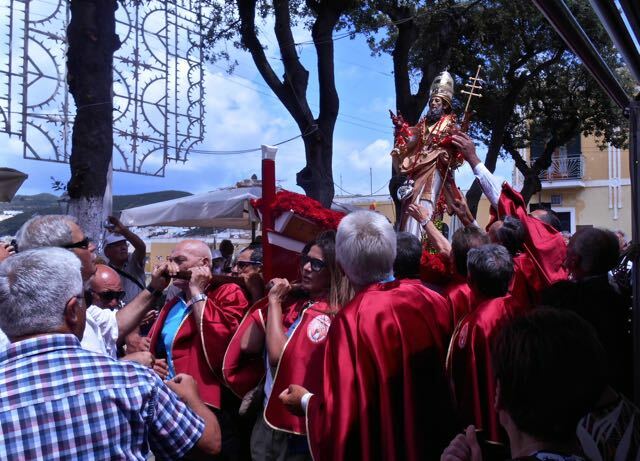 The procession is led by young children waving incense followed by the older residents of the island walking with the saint and reciting the rosary as the ornate icon makes it's way through town towards the sea. I can smell the roses that decorate the gilded boat where the revered statue of San Silverio sits atop as he floats past on the shoulders of the towns faithful. Before the shops shut for the middle part of the day we shop for dinner supplies in one of the small alimentari. I order thin slices of prosciutto and milky mozzarella while Mark picks out tart red tomatoes, a fragrant melon, sweet sticky figs and handfuls of cherries. My next stop is to get something for lunch. I point and order roast chicken, a few portions of melanzane parmigiana from a large tray, slabs of pizza bianca some stuffed with bitter greens and others topped with jewel like roasted cherry tomatoes. While I wait, Nona come out of the kitchen in the back, wiping her hands on her apron, her young granddaughter running plates of food to the long bank of tables lined up outside while her mother shouts instructions to the pizzaioli behind the counter. 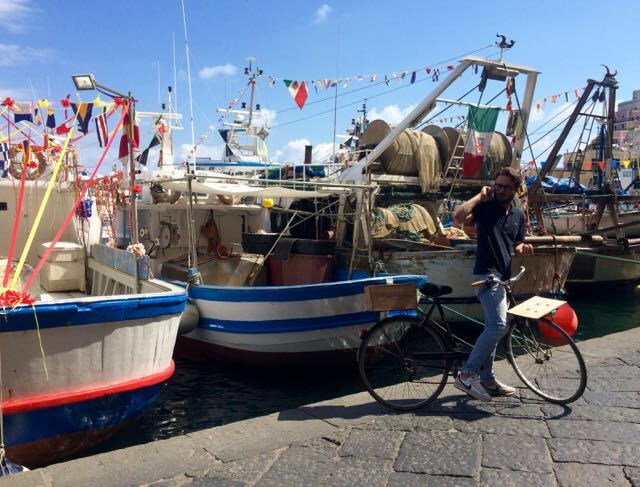 Before we head back to our quiet corner across the small bay, we chat with the sun bleached blue eyed blonde Roman about his brand new craft beer shop at the end of the harbor street and the labyrinth of challenges faced to set up a business on an island. The rustic house we rent requires a short boat trip or taxi ride down a vertiginous hill, a number of crooked steps, and a long walk down a narrow path of sorts. Along the way you might come across a turquoise feathered pheasant or hear the mewing of a kitten, the chatter of tiny birds or the squawk of a seagull. 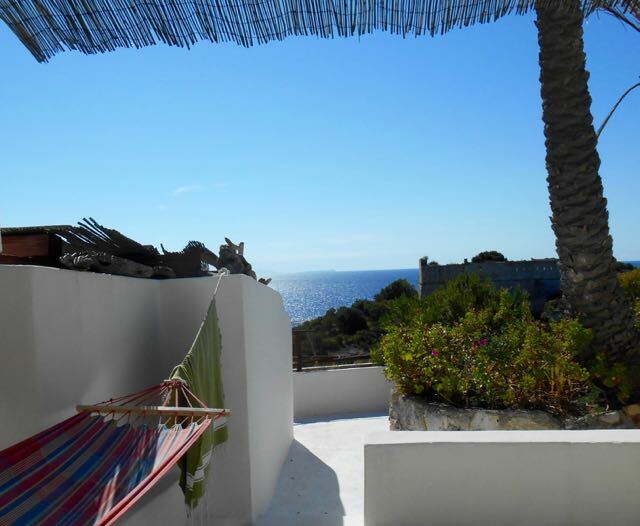 The reward is a whitewashed peaceful place with a view towards colorful houses in the port. The unspooling and clank of the anchor chain, the tritone of the ferry horn announcing its arrival, the flub flub flub of a boat motor are the soundtrack that I hear from terrace. 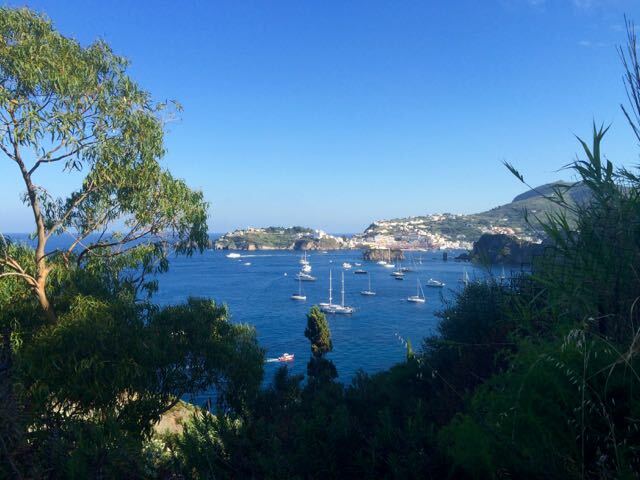 We swim in the sea in the late afternoon sun, bobbing in the cool blue green water with the sleek yachts and sailboats. 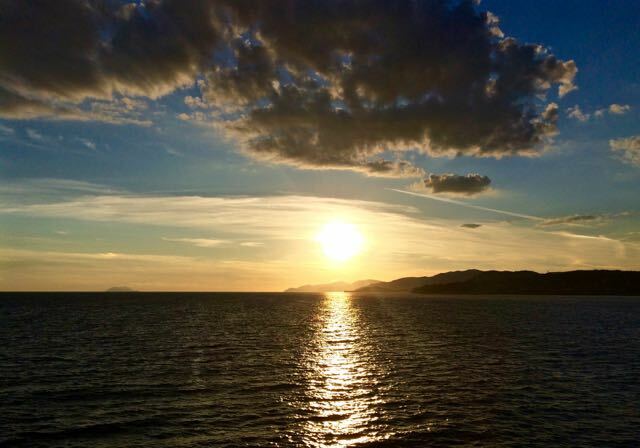 When it is time to leave, we reluctantly take the last ferry back to the mainland passing Monte Circeo on our left watching the sun sink behind her in a warm blaze of orange so different from the cool sapphire sparkle of the arrival journey. Back on the train to Rome my skin prickly with sun and salt I close my eyes and dream. 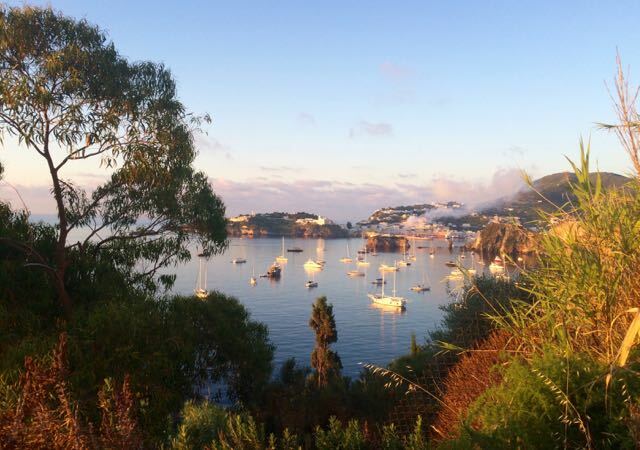 For more information about the places I love on Ponza download my ebook.